For anyone running an AMD GPU from a few years back, you’ve probably come across a piece of software installed on your computer from Raptr, Inc. If you don’t remember installing it, it’s because for several years it was installed silently along-side your AMD drivers. The software was marketed to the gaming community and labeled AMD Gaming Evolved. While I haven’t ever actually used the software, I’ve gathered that it allowed you to tweak your GPU as well as record your gameplay using another application called playstv. I personally discovered the software while performing a routine check of what software running on my PC was listening for inbound connections. I try to make it a point to at least give a minimal amount of attention to any software I find accepting connections from outside of my PC. However, when I originally discovered this, my free time was scarce so I just made a note of it and uninstalled the software. The following screenshot shows the “plays_service.exe“ binary listening on all interfaces on what appears to be an ephemeral port. Fast forward two years, I update my AMD drivers and notice “plays_service.exe” has shown up on my computer again. This time I decide to give it a little more attention. Opening up plays_service.exe in IDA, we see the usual boiler plate service code and trace it down to the main entry point. From here we almost immediately recognize that this application is python based and has been packaged with something like py2exe. 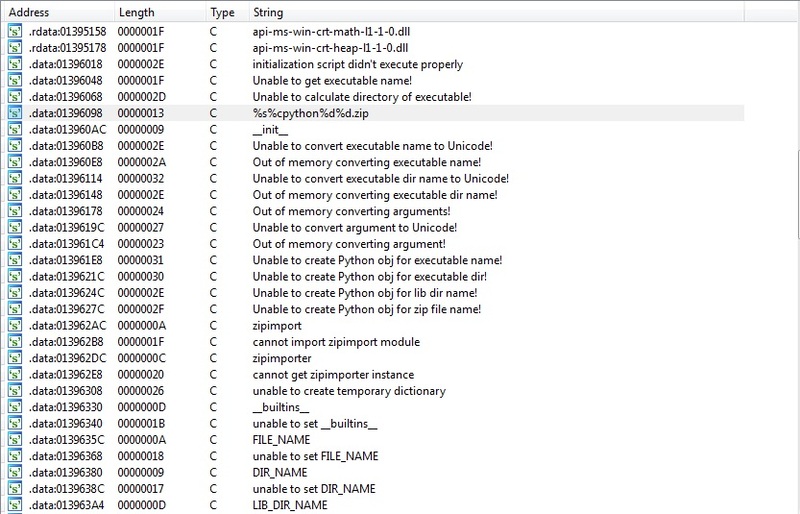 While decompiling python byte code is rather trivial, the trick with these types of executables is identifying and locating the python classes. Python byte-code in a py2exe packaged binary is typically embedded in the executable or loaded from some relative path on disk. At this point, I usually open up the strings subview in IDA to see if anything obvious jumps out. I see at least a few interesting string references that are worth investigating. Several of them look like they may have something to do with the initialization of python. The first string I track down is “Unable to create Python obj for executable name!” . At first glance it appears to be an error message if certain python objects aren’t created properly. Scrolling up in the function it references, I see the following code. This function appears to be the python setup routine. Returning to my list of strings, I see several references to zip. I decided to search through the install directory and see if there were any zip files present. Success, only one zip file exists and it is named python35.zip! It’s filename also matches the format string of one of the string references above. I unzip the file and peruse its contents. 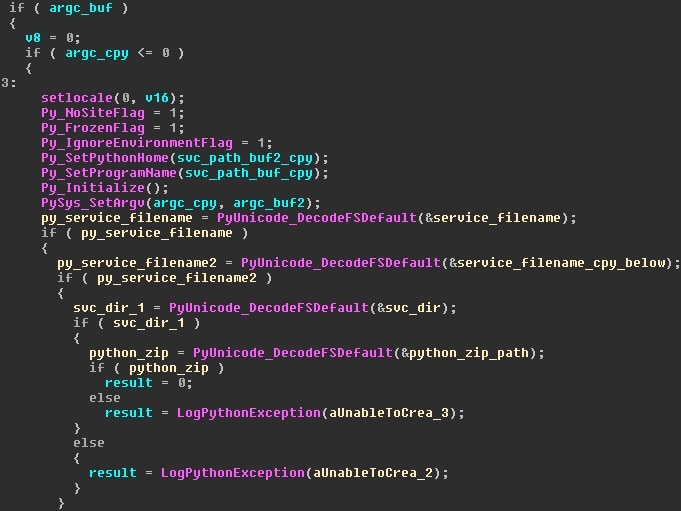 The zip file contains thousands of compiled bytecode python files which I presume to be the applications core source code and library dependencies. Looking through the compiled python files, I see three that may be the service’s source code. I decompiled each of the files using uncompyle6 and opened them up in a text editor. The largest of the three, plays_service.pyc, turned out to be the main service source. The service is a basic HTTP server made up of a few simple classes. It binds to an ephermal port on startup and writes the port to the registry to be used by the greater application. 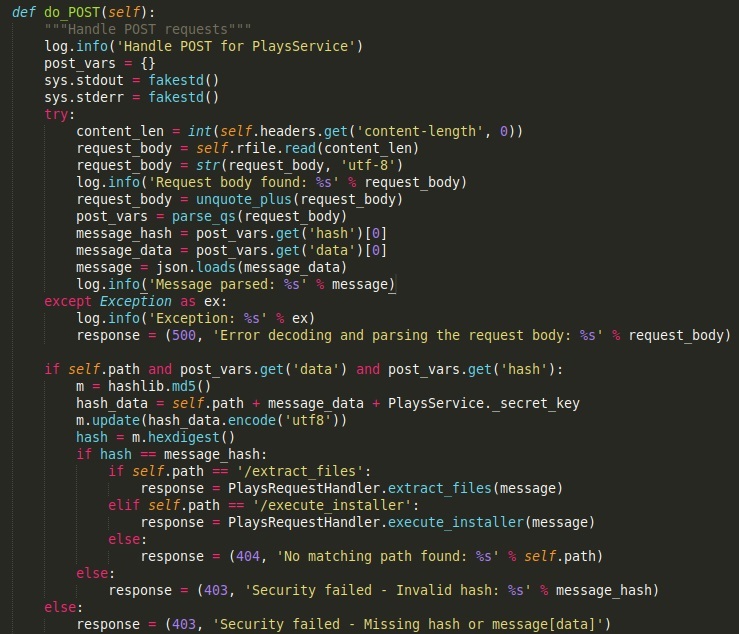 The POST request handler code is listed below. The handler expects a JSON formatted POST request with a couple of parameters. The first is the data parameter which holds the command to be processed. The second is a hash value of the data provided and a secret key. Lucky for us, the secret key just so happens to be hard-coded in the class definition. If the computed hash matches the one provided, the handler calls one of two defined command function, “extract_files” or “execute_installer”. From here I began to look at the “execute_installer” function because the name sounded quite promising. The function logic is pretty straight forward. It performs a couple insignificant checks, resolves two paths passed as parameters to the POST request, and then calls CreateProcess. The most important detail of note is that while it looks like a fully controlled command injection is possible, the calls to win32api.GetShortPathName throw an exception if the parameter passed does not resolve to a file. 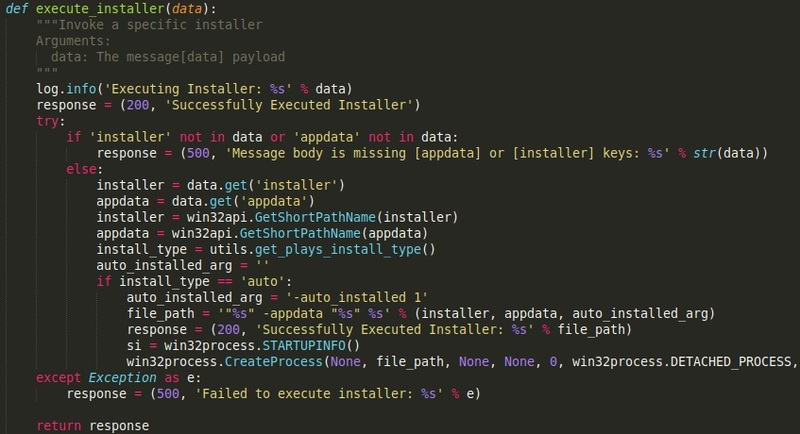 This limits the exploitation of this vulnerability significantly but still allows for privilege escalation to SYSTEM and remote compromise using anonymous outbound SMB. Exploiting this “feature” for file execution didn’t take a significant amount of work. The only real requirements were properly setting up the POST request and hashing the right portion of data. A proof of concept for achieving file execution with this vulnerability (CVE-2018-6546) can be found here.